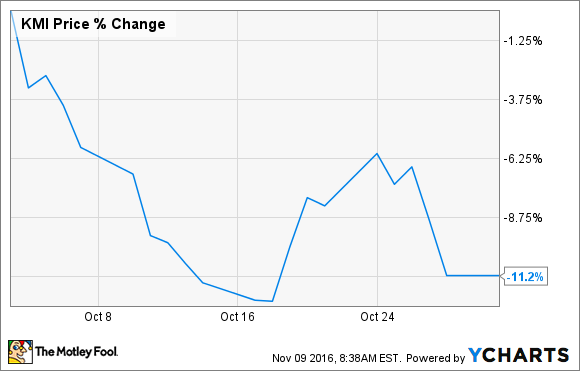 Why Did Kinder Morgan Inc.'s Stock Slump 11.2% in October? The pipeline giant plunged despite a solid quarter. The pipeline giant's October slide started picking up speed early on after an analyst at Stifel downgraded the stock from buy to hold, citing the valuation as a result of a nearly 50% rebound since the start of the year. While Stifel thought that the company took critical steps forward, especially on improving its balance sheet, it believed that the market had already baked those into the stock price. Further, it was concerned that the company would deliver a meager 2% EBITDA (earnings before interest, taxes, depreciation, and amortization) growth in 2017 due to the recent sale of a 50% stake in its Southern Natural Gas pipeline to Southern Company (NYSE:SO). That said, Kinder Morgan's stock bounced after the company reported third-quarter results that were right on target. Management noted that, while distributable cash flow was down 4.3% year over year to $1.1 billion, earnings were basically in line with expectations. Because of that, it was reaffirming its full-year outlook for distributable cash flow, though it was cutting guidance for adjusted EBITDA a bit due to the impact of the Southern Company deal. Analysts liked the quarter, with Credit Suisse, for example, upgrading shares from neutral to outperform. Meanwhile, Stifel reversed its earlier downgrade and moved the stock back up to buy citing the potential that the company could joint venture its Trans Mountain expansion project to accelerate its ability to return more cash to investors. Additional analysts piled in with upgrades, most citing the growing likelihood that the company would give its investors a significant dividend boost by mid-2018 at the latest. There's no one catalyst to point to as the culprit behind Kinder Morgan's October sell-off, other than possible profit taking after the stock entered the month up 50% for the year. Because of that, it could be a good time for long-term investors to pick up shares in anticipation of the growing possibility of a big dividend increase in the future.